Just World Books, 9781935982227, 286pp. In 2006, Rabbi Brant Rosen launched a blog called Shalom Rav, in which he reflected on various social-justice issues. In 2008, Israel launched a harsh attack against Gaza—and caused Rosen to deeply question his lifelong liberal Zionism. Unlike the biblical Jacob, who wrestled with his conscience in the dark of night, Rabbi Rosen chose to "wrestle in the daylight", which he did through many deep, thoughtful interactions on his blog. The Foreword is written by Adam Horowitz, Co-Editor of the current affairs website Mondoweiss.net. 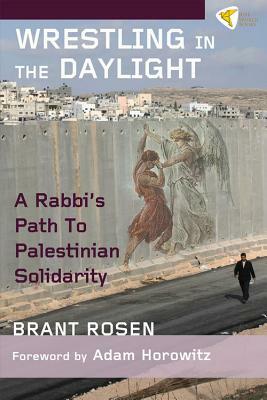 Brant Rosen, author of Wrestling in the Daylight: A Rabbi's Path to Palestinian Solidarity, is a Chicago-based rabbi, blogger, and social activist. He is currently the director of the American Friends Service Committee Midwest office and co-chair of the Jewish Voice for Peace Rabbinical Council. In 2014, Rosen, who had lengthy previous experience as a congregational rabbi in Evanston, IL, co-founded a social-justice focused congregation called Tzedek Chicago.